UN spokesman in Colombo Gordon Weiss has said the situation in Sri Lanka is critical and changing hour by hour. He warned of a bloodbath and said it had become a truly terrible situation for civilians caught up in the conflict zone. He was speaking as senior United Nations official, Vijay Nambiar, headed to Sri Lanka to press for an end to the fighting to try to resolve the growing humanitarian crisis. Aerial footage has been provided by the Sri Lanka air force. 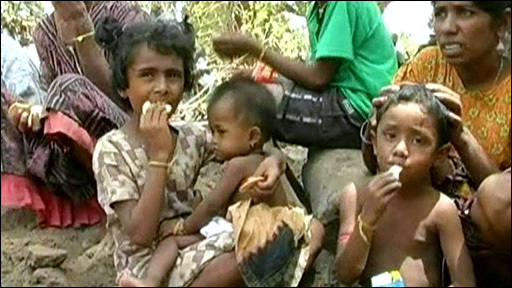 Footage of refugees being handed food was broadcast on Sri Lankan television.